This is an okay adaptation, occasionally more interesting than expected, yet the choppy story is presented not for telling-the-tale purposes, but more for the indulgent use of the eye-popping computer creations. The word “computer” is used as a descriptive, only because the human cast is so much smaller against it all, both physically next to the pixel-rendered giants and metaphorically as their role seems secondary to the showier landscape of see-what-we-can-do-now. Even though everything seems to be happening spectacularly on screen, the film is oddly flat in several places, which points toward its reliance of green screen effects over the connective intimacy that the best fairy tales have. Luckily the actors have a good time, and the film doesn’t take itself too seriously. Jack (Nicholas Hoult) begins the story as a child, a motherless boy whose father regales him with stories of the land of the giants above them (“fee, fi, fo, fum”). This is paired with Princess Isabelle (Eleanor Tomlinson) hearing the same story as a child, as her mother reads it to her. When Princess Isabelle grows up, she becomes heir to the throne of her father, King Brahmwell (Ian McShane), and they both mourn the death of her mother, his wife. Jack, meanwhile, has lost his father, and is being raised by a angry uncle. Jack is charged with going into the kingdom to sell a horse and carriage. He stops in a theater where a performance of his favorite story is taking place. The princess is there too, incognito, and the couple have their first encounter. An errant monk convinces Jack to sell his horse for some beans, and the familiar story begins anew. 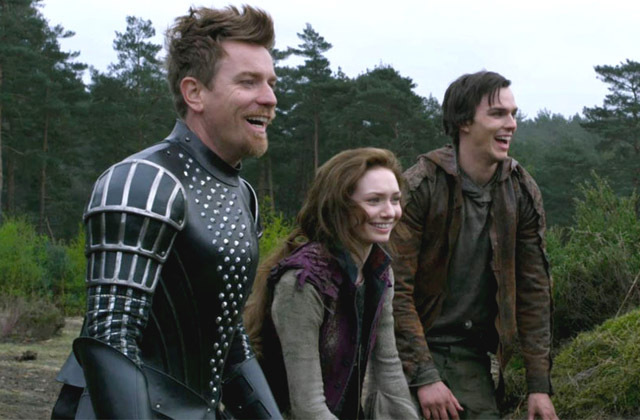 Jack is joined in his adventure with Elmont the King’s guard (Ewan McGregor), Roderick the King’s advisor (Stanley Tucci) and the blessing of King B., for now in the circumstance of the new beanstalk, his daughter is trapped in the upper world of the giants. Submitted by Factor (not verified) on March 2, 2013 - 10:37pm. I’ve seen some pretty mixed reviews for this movie, so I’m glad to see one that says it’s an entertaining movie. I’m looking forward to seeing it now!